The conference room was almost full. Thirty one ICanServe e-group members exchanged hi’s and hello’s, followed by the warm hugs of long-time online friends who couldn’t believe they were probably seeing one another for the first time. 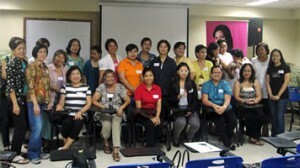 Fourteen (14) companions, mostly husbands or sisters, patiently listened to the pre-lecture chats until ICanServe director Lanie Eusebio officially opened the program by welcoming the participants. Dr. Cecille Montales, head of ICanServe’s Patient Services committee, introduced the speakers. ICanServe volunteer and e-group member Carol Santos was a smiling and enthusiastic first speaker. She is a breast cancer survivor who had lymphedema on her left arm right after surgery. Fortunately, she was able to keep it mild. Carol knew that she had lymphedema when she felt tightness in her arm. There was discomfort because of water retention and it became about 1-2 cm bigger than the right arm. She recommended practical self- help activities like elevation of the affected arm while lying on bed and regular exercise, like stationary biking which helps activate lymph nodes. She wears her arm sleeve at daytime and she removes it at night before she sleeps. Lymphatic massage also helps which is very different from traditional massage that involves heavy pressing or kneading of the muscles. Carol describes this massage as “haplos” type. She added that cancer survivors with their lymph nodes removed should be vigilant in preventing and managing lymphedema because once one has it, she will have it forever. In the open forum, one question was, “Is it possible to get lymphedema five years (or longer) after surgery?” Carol replied that even if one does not have lymphedema for years after surgery, it is not an assurance one is in the clear. There is still need to be careful especially in lifting heavy objects. Regular use of arm sleeves while flying will prevent lymphedema since the airplane’s pressurized cabin stimulates accumulation of water in the some parts of the body like the legs and feet. This could easily happen to the affected arm. As for the acceptability of sports like badminton and tennis, Carol candidly answered that such heavy and strenuous activities are not good for the affected arm. Emily Mendoza Sanders, the second speaker, is a physical therapist with 20 years experience in the US. She decided to move back to the Philippines so her children could study here. She is now a professor of physical therapy in the University of Santo Tomas. The professor that she is, Emily gave a short quiz: one page with 10 true or false questions and five multiple choice questions. With limited knowledge on lymphedema, it took participants awhile to answer the questions. Emily defined lymphedema as a condition of localizing fluid retention and tissue swelling caused by a compromised lymphatic system. Using a power point presentation, she described the lymphatic system as a network in the human body with four components: lymphatic tissue (serve as capillaries), lymphatic vessels (serve as valves), lymph nodes (process fluids) and lymphatic load (goes to the heart). The removal of lymph nodes from the underarm area (done for testing of cancer cells) makes It harder for fluid in the arm to flow out of this area. This may cause the build-up of lymph fluid in the fatty tissue under the skin. Emily suggested some guidelines in avoiding or minimizing lymphedema. She said prevention is the best defense against lymphedema. Always use arm sleeves when flying. Avoid lifting heavy objects and strenuous sports/activities. Avoid prolonged hot baths/saunas. Avoid having blood pressure taken in the affected arm. Avoid injuries such as cuts and scrapes on the affected arm.Emily also demonstrated the right lymphatic massage with a volunteer participant, Tess Rolle. She also demonstrated this type of massage on the arms of each participant. It was really light like the “haplos” mentioned by Carol earlier. She went back to sister Tess, giving her a light massage on the neck and the back. Tess said she felt better after a few minutes. Her affected arm felt lighter and smaller. Emily explained that the affected arm is usually measured before and after the massage to see the improvement in size. The session ended with another quiz from the professor. Given the same questions, participants answered then passed their papers quickly and without hesitation.It was a fruitful afternoon for the ICanServe community, learning all about lymphedema and helping breast cancer survivors cope with the risks of surgical treatment.